Chamomile Tea — FAYE MAKES FOOD. Right: Mad Tea Party, a tinted version of one of Sir John Tenniel's original illustrations for Lewis Carroll's novel Alice's Adventures in Wonderland (1865). See more of his amazing illustrations for the book here. Tea is one of those elemental, nurturing comforts always waiting for us when we need it. Drinking it can be a ritual, a well-timed medicine, a cleansing, a memory of warmth. 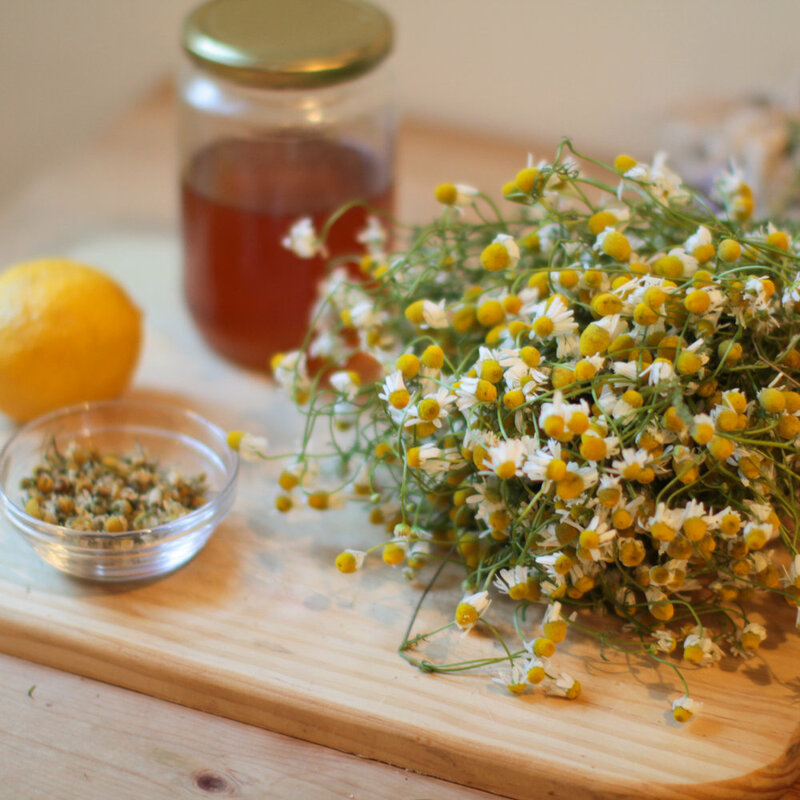 While it can be difficult to disassociate other teas from a heritage tied to slavery and other forms of oppression of colonized peoples, chamomile is a more peaceful tea, in many places growing wild. Its beautiful little daisy flowers have been prepared as a tea since ancient times, and put to many other uses as well. Egyptian noblewomen crushed the petals onto their skin for cosmetic rejuvenation. Gardeners plant it near ailing plants to revivify them. Its petals may even help to heal wounds. It certainly helps with any digestive ailment, and was always given to me as such during my childhood. It is currently being researched for anti-anxiety effects, and its calming, soothing tea is the perfect way to mark the day's end. This pairing was inspired by Lewis Carroll's wonderful story published in 1865, Alice's Adventures in Wonderland, wherein the characters lives converge around a table for tea, birthing a slew of witticisms and character reveals. The first of many film productions of the novel was made by directors Cecil Hepworth and Percy Stow and was 12 minutes long. The only surviving print is severely damaged, but has been preserved in the British Film Institute (BFI) National Archive, with original color tints restored. I've included the video at the end of this post—with its magical early cinema low-frame-rate and whimsical vibe, it's well worth the twelve minutes it takes to watch it. 1. Pick the flowers off of the stems, saving buds and petals. 2. Boil water, mix in flowers, turn off heat, cover for ten minutes. 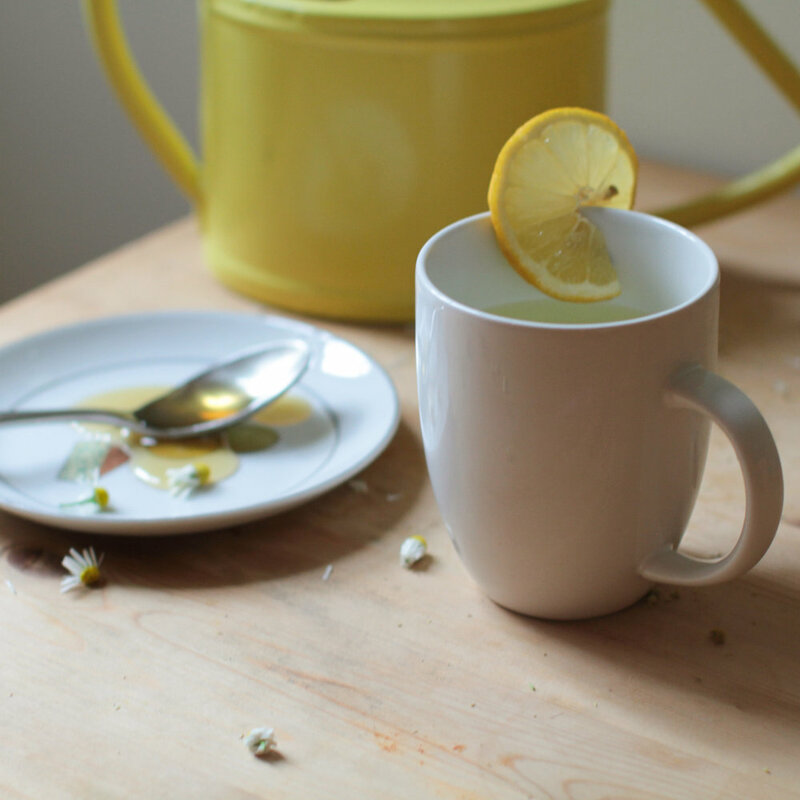 Honey is delicious with chamomile. Some people enjoy lemon as well, although I think this particular tea is better without. Don't hesitate to steep the same flowers twice to make full use of them.To save the flowers for future tea, pick the flowers off the stems the day you get them, as they only last a a day or two before wilting. Place in open air to dry, then store in a jar. Use any leftover tea to naturally lighten hair. My sister and I used to do this under the Greek summer sun as kids. Strain the tea then pour it onto freshly washed hair and either a) sleep with the chamomile rinse on, with a towel on your pillow, or b) spend a couple hours in the sun before rinsing. A tinted version of Sir John Tenniel's original illustrations for Lewis Carroll's novel Alice's Adventures in Wonderland (1865). See more of his amazing illustrations for the book here. Below: The first film production of Alice in Wonderland, by directors Cecil Hepworth and Percy Stow. 12 min. Courtesy of the BFI National Archive.